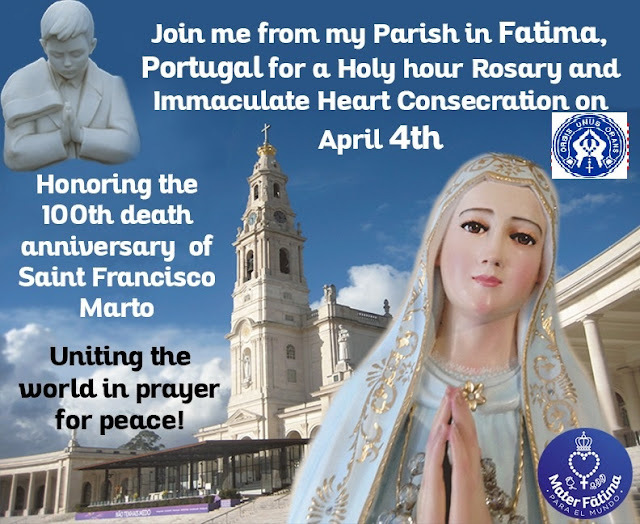 On the occasion of the Centenary of the death of St. Francisco Marto, on April 4, 2019, the group “Mater Fatima” is promoting this under Fr. Héctor Alfonso, Chaplain of the Fatima Shrine, Portugal for the Spanish speaking pilgrims. 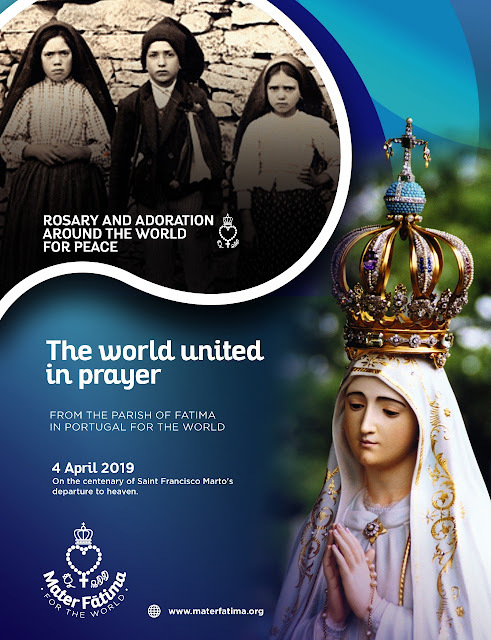 The main celebration will take place at the Parish Church of Fatima, where the Fatima shepherd children were baptized and where Saint Francisco Marto, in particular, spent many hours in prayer and adoration, consoling the “Hidden Jesus” HE Antonio Cardinal Marto, Bishop of Leiria-Fatima will join here. ► Any date close to April 4th will also do. ► You can pray individually or in a group, this is for all faithful. ► Please FAST as possible on this day as health or age permits. Before Exposition (Introduction): We are here to pray, adore, make reparation and thank our Redeemer Jesus, who is God-the Supreme Being Really Present here in Body, Blood, Soul and Divinity, for World peace, conversion of sinners and reparation to the Hearts of Jesus and Mary. Moderator: Please kneel: In the name of The Father, and of the Son and of the Holy Spirit. Amen. Hymn: O Sacrament Most Holy, O Sacrament Divine all Praise and all thanks giving be every moment Thine. O Most Holy Trinity, please give us the grace to say often this sacrifice prayer as taught by our lady, daily when we make some sacrifice (please repeat): O Jesus, it is for love of Thee, for the conversion of sinners, and in reparation, for the sins committed, against the Immaculate Heart of Mary. 5] The coming of the definitive triumph of the Immaculate Heart of Mary. WE WILL NOW DO THE Consecration Prayer, kneeling: To You, Virgin Mary, Mother of God and Our Mother, to Your Immaculate Heart I consecrate, surrender and give myself completely to the Lord. Take me under Your maternal protection, defend me from the dangers that surround me. Help me to overcome the temptations that tempt me to do evil. Help me to preserve the purity of my body, my spirit and my heart. Take me to Jesus, Your Son and Son of God, to be united to Him on the altar and to be offered to the Father as a small sacrifice of love, for eternal praise to the Blessed Trinity, whom I adore and love. I believe in His love and in His mercy, I hope to sing with you, oh Mary, forever, the praise of His Glory. (Composed on October 29, 1986 in the Carmel of Coimbra, by the Servant of God Sister Lucia of Jesus and the Immaculate Heart) Imprimatur: Coimbra, July 16, 2010, P. Pedro Lourenco Ferreira, Provincial OCD). LET US PRAY: O God who in this wondrous Sacrament have left us as memorial of Your Passion, grant us we beseech You, so to revere, the Sacred Mysteries of Your Body and Blood, that we may continually find in our souls, the fruit of Your redemption, who live and reign forever and ever. Amen. Blessed be St. Joseph Her Most Chaste Spouse. Blessed be God in His Angles and in His Saints! Moderator: In the name of The Father, and of the Son and of the Holy Spirit. Amen. 4. The definitive triumph of the Immaculate Heart of Mary. The act of consecration to the IHM can be taken from the formula of St. John Paul II for the collegial consecration. PD. Kindly promote this email between your contacts of the WAF. This event is being organised from Fatima, and as you will see, people are being asked to join in a worldwide rosary on Thursday 4 April, preferably at 8 pm, for the intentions on the poster, including world peace. Please do help to promote this in your parish, and if you can, on social media! The message of Fatima sums up a vehement appeal to prayer, to pray the Rosary. Our Lady, at all her apparitions in Fatima, asked the little shepherds to pray the rosary daily in order to achieve world peace, for conversion of the poor souls and because many souls went to hell because there is no one making sacrifices and praying for them. This request that Our Lady made to the little shepherds in 1917 she continues to make to all of us. The message of Fatima remains very timely and much needed nowadays: we need to pray the Rosary more and more in order this to save many souls and achieve a much needed world peace! 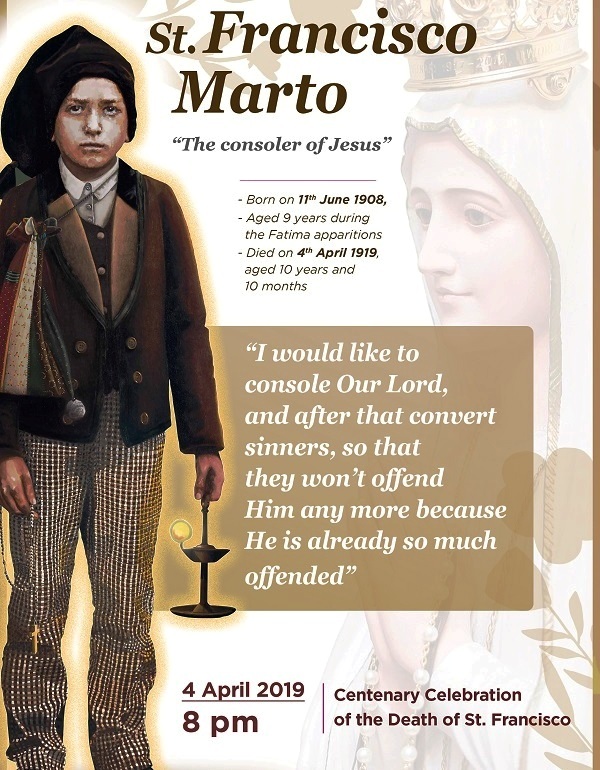 Therefore, in honor of the centenary of the departure to Heaven of the little shepherds Saint Francisco Marto (4 April 2019) and Santa Jacinta Marto (20 February 2020), a moment of prayer with the title: 'Mater Fatima for the world' will take place at the Parish Church of Fatima. This event aims to make people aware and invite congregations from all over the world to unite in prayer, responding to the constant request of Our Lady to pray, as she asked in all her apparitions in 1917. During this moment of prayer, we will pray for Peace in the world, for the conversion of the poor sinners, reparation of outrages, sacrileges and indifference against the Real Presence of Christ in the Eucharist, in reparation for the offenses committed against the Immaculate Heart of Mary, and in intercession for the salvation of the Blessed Souls of the Purgatory. On this day, as a way of intensifying the prayer, we will invite people to fast. For this reason, we would like to invite you to join us at this time of prayer and to spread it through your dioceses (parishes, convents, schools, hospitals, prisons, families, etc.). We will be at your entire disposal to clarify all your questions and doubts about the scheme project. 1. Assembly already placed 15 minutes before the time. A. Makes the preparations and predisposes the assembly. B. Greets everyone in the world who are united by means of communication. C. Explains the meaning of the world Rosary for peace. 1. The priest with the acolytes in procession goes to the tabernacle and exposes the Blessed Sacrament. The procession begins from the back of the Church. 2. Song: Ó Jesus é por vosso amor. 3. The beginning of confessions for the people who want. 2. The set up will be in questions. 3. The chairman asks the questions. The answer "Yes, I believe" singing. 4. The assembly is standing. 1. There are two different moments to be introduced by a word from the advisor. 2. The first will be chanted and the second spoken. A. MY GOD, I believe, I adore, I wait for and I love Thee! I ask pardon for those who do not believe, do not adore, do not wait for and do not love Thee. in reparation for the insults, sacrileges, and indifference with which He is offended. And through the infinite merit of His Most Sacred Heart, and of the Immaculate Heart of Mary, I beg of Thee for the conversion of poor sinners. Intention: We pray this Mystery for peace in the world, for the Holy Father and for the end of abortion. B. Intentions: in Portuguese and in English. E. Gloria Patri ... in Latin. Intention: We pray this Mystery, in an act of reparation to the Hearts of Jesus and Mary. B. Intentions: in Portuguese and in Spanish. C. Our Father and 5 Hail Marys: In Spanish. D. 5 Ave Marias: in Japanese. Intention: Let us pray for the souls of Purgatory. C. Our Father and 5 Hail Marys: in Italian. Intention: Let us pray for all the peoples who live in sadness and suffering caused by Russia's mistakes, and for the conversion of Russia. C. Our Father and 5 Hail Marys: in French. D. 5 Ave Marias: in Russian. Intention: We pray this Mystery for the conversion of the poor sinners. B. Intent: in Portuguese and in English. C. Our Father and 5 Hail Marys: in German. D. 5 Ave Marias: in Polish. 6. Three Hail Marys in honor of the purity of Our Lady. To achieve plenary indulgence. For the children in the whole world. 1. Introduced by the advisor. 2. The chairman kneeling before the Blessed Sacrament prays the consecration. 3. Song : Totus Tuus. 1. The acolytes carry the incense. 2. Placement of the Shoulder Veil. Acolytes go to the Tabernacle. 1. Hymn of the Little Shepherds. 1. Song: Ave de Fátima. Jesus went from Galilee to the Jordan River in order to meet John, to be baptized by him. (...). After being baptized, Jesus left the water immediately. Then, the Heaven opened and Jesus saw the Spirit of God descending like a dove and laying on Him. From the Heaven came a voice, saying, "This is my beloved Son, whom I love." On May 13, 1917, Heaven opened to the world, and the voice of God spoke, through the words of Our Lady, to the little shepherds: Lucia, Francisco and Jacinta. Then, Mary began to rise serenely, towards the point where the sun rises, until she disappeared into the immensity of sky. The light that surrounded her looked as if it was opening a path, making a way among the stars, which is why we say that we have seen open the sky. (May 13, 1917). world a Light so great that it is God?" Let us pray this mystery for peace in the world, for the Holy Father and for the end of abortion. There was a wedding at Caná of Galilee and the Mother of Jesus was there. Jesus and his disciples had also been invited to the wedding. When the wine ran short, the Mother of Jesus said to Him: "They have no wine." (...) Jesus said to the servants, "Fill the jars with water (...) and take them to the headwaiter." The headwaiter tasted the water that had become wine, not knowing where it came from. (...). This was Jesus' first miracle. (...). He thus manifested His glory and His disciples believed in Him. (Jn 2: 11-11). "I’d wanted to ask You to tell us who You are, and to make a miracle for everyone to believe that You are appearing to us." "What I loved the most was to see Our Lord, in that Light that Our Lady had put in our hearts." Since the first appearance of the Angel: "The hearts of Jesus and Mary are attentive to the voice of your petitions." We pray this Mystery in an act of reparation to the Hearts of Jesus and Mary. Jesus went throughout all Galilee, teaching in their synagogues proclaiming the Gospel of the Kingdom, and healing all kinds of disease and affliction among the people. And the fame of Jesus spread throughout Syria. (Mt 4, 23-25). Attracted by the expansive fame of the apparitions, the crowd, thristy of the Good News, came to the place named Cova da Iria. We are at the moment of the Apparition in the month of September. As the hour approached, I went with Jacinta and Francisco to the place, in the middle of a crowd who barely let us walk. (...). Everyone wanted to see us and talk. (...) they came kneeling down before us, asking us to ask Our Lady for their needs. The Light of eternity, in the words of Francis: "I really enjoyed seeing Our Lord: but I liked it more when we saw Him in that light where we were too. Soon, Our Lord will take me to His feet and then I will always see Him." Let us pray for the souls of Purgatory. Jesus took Peter, John, and James with him, and went up to the mountain to pray. As he was praying, the appearance of his face changed, and his clothes became as bright as a flash of lightning. One fine day, we climbed the hillside, when suddenly a strong wind shook the trees and made us look up to see what was happening, (...) we started to see in some distance, toward the East, a light whiter than snow, in the shape of a young man, transparent, brighter than a crystal pierced by the sun's rays. "I love God so much! But He is so sad because of so many sins! I want to comfort Him with prayer and penance. We must never sin!" Let us pray, for all the peoples who live in sadness and suffering from Russia's faults and for the conversion of Russia. While they were eating, Jesus took a loaf of bread, and after blessing it he broke it, gave it to the disciples, and said, “Take, eat; this is my body.” Then he took a cup, and after giving thanks he gave it to them, saying, “Drink from it, all of you; for this is my blood of the covenant, which is poured out for many for the forgiveness of sins." (...) Holding in his hands a chalice upon which he held a Host, ... Leaving the chalice and the Host suspended in the air, the Angel prostrated himself to the ground (...). "Take and drink the Body and Blood of Jesus Christ, who is horribly insulted by ungrateful men. Make reparations for their crimes and console your God." "Did you not see how Our Lady became so sad, last month, when she told us not to offend God, our Lord who is already greatly offended? I wanted to Our Lord and then convert the sinners. " Let us pray this Mystery for the conversion of the poor sinners. O Mother of men and peoples, You who know all their sufferings and their hopes, You who have a mother’s awareness of all the struggles between good and evil, between light and darkness which afflict the modern world, accept the cry which we, moved by the Holy Spirit, address directly to Your Heart. Behold, as we stand before you, Mother of Christ, before your Immaculate Heart. We want to unite with our Redeemer in this consecration for the world, for Russia, and for men, which, in His Divine Heart, has the power to reach forgiveness and to get reparation. Mother of the Church! Enlighten the People of God along the paths of faith, hope and charity! Help us overcome the threat of evil, which is so easily rooted in the hearts of men and that seems to close the paths of the future. · From hunger and war, deliver us! · From sins against the life of man in all its stages, deliver us! · From attempts to stifle in human hearts the very truth of God, deliver us! · From the loss of awareness of good and evil, deliver us! · From sins against the Holy Spirit, deliver us! May the time of peace and freedom, the time of truth, justice and hope, come near to all. Take under your maternal protection the whole human family, which with rapture we entrust you, Ó Mother! Help us to live the Consecration to Christ and the world’s and Russia's consecration with truth by placing them in Your Immaculate Heart. Praise be to You, who are united to the redemptive Consecration of Your Son!